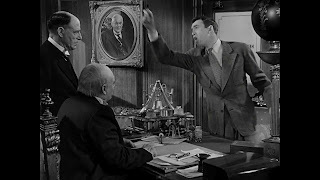 For a presence so felt in a film as that of Mr. Potter, it's surprising we don't ever see where the man lives or what such a man would call home. 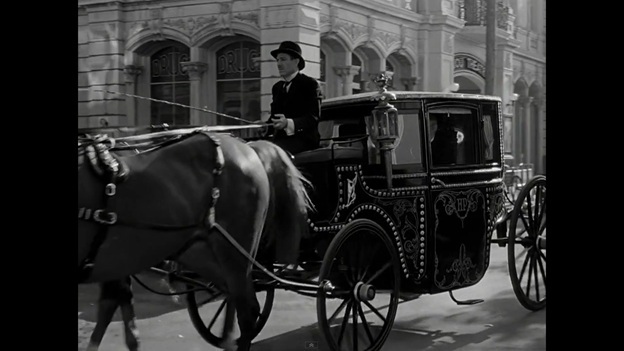 Judging from his taste for horse and a coach, even in 1918 one can assume that such a building would be a grand one in all sense of the word. From a directors point of view also, it's surprising that Potter's residence isn't used as a kind of visual representation of his separation and wealth. As Clarence exclaims in his question "a king!? ", such a man's castle would surely do the trick. But perhaps Capra does indeed tell us something by not showing us the Potter house. 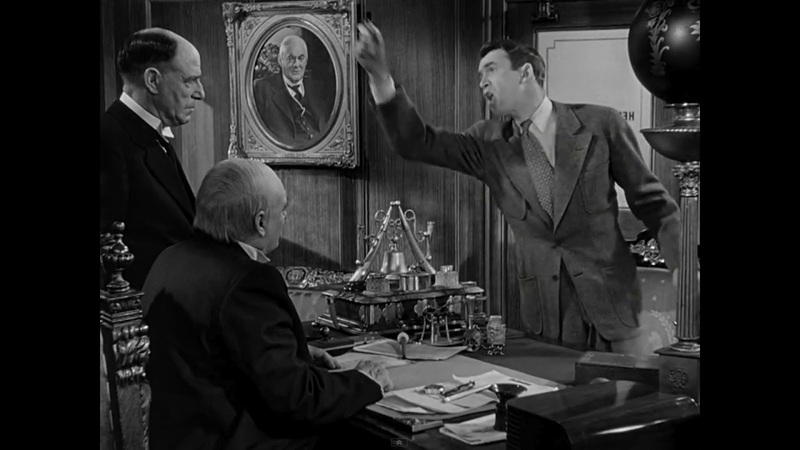 What we do see, is that when someone wants to see Mr. Potter it's always at his office in the bank. 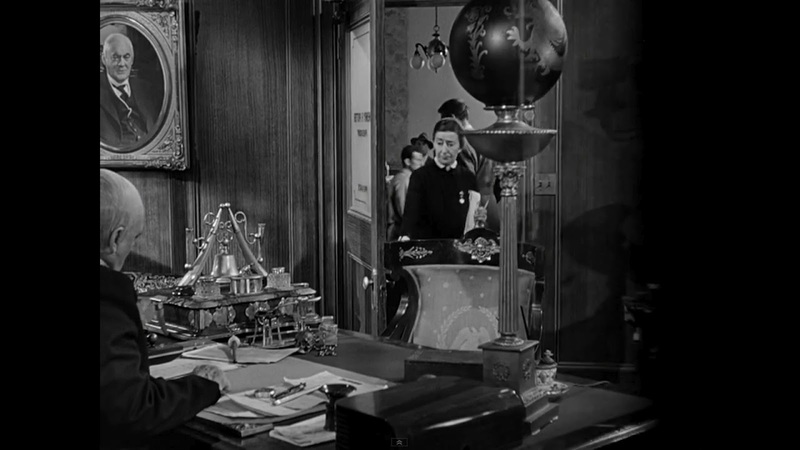 That fact that it's always at the bank that we can find him, rather than at home is more telling of the man. He spends most of hist time at work, close to his money, and where he can keep an eye on the towns financial business somewhat. His office there is decorated and fill the room. 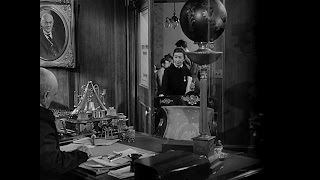 We do however see his office at home just prior to his move over to the bank. Though not confirmed it must be from his home. It's our only glimpse of perhaps what truly is likely the spider lair. Here is the only view at potentially the Potter mansion. Notice again his own portrait hanging there (the other two are in the bank) and likewise 2 additional busts of Napoleon. 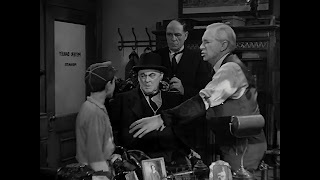 In what should be not news, everyone should know that Henry Potter was played to perfection (or infamy) by the great (and I do mean great) Lionel Barrymore. 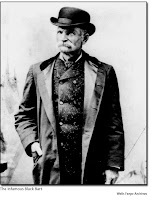 Born when the outlaw Black Bart was still robbing stagecoaches, Lionel was born into an acting family , one that can claim well over a century of performing, Barrymore has quite the famous career even when only counting jobs in moving pictures with sound. 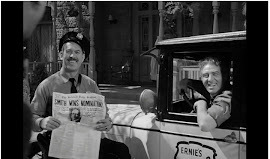 In fantastic films ranging from 'You can't take it with you' (with Jean Arthur), 'Captains Courageous' (with Spencer Tracy) to 'The Gorgeous Hussy' (with Jimmy Stewart). 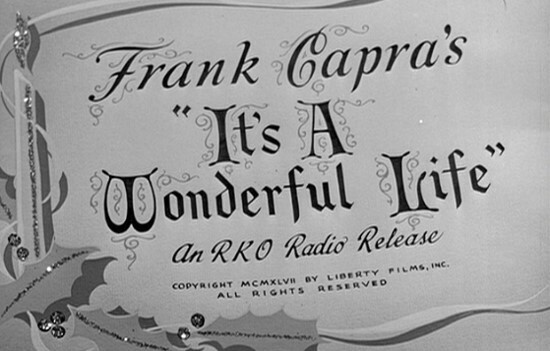 Lionel was almost always known prior to It's a Wonderful Life as a fatherly or grandfatherly figure with the utmost kindness or sincere compassionate nature and afterwards as mostly simply Mr. Potter. 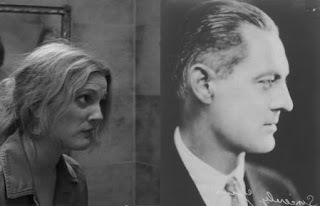 On a side note, Lionel Barrymore is also indeed related directly to the modern Drew Barrymore for whom her first, and middle names are direct takes of her famous ancestral acting surnames. Browse some pictures, I think you'll see some resemblance. Chins maybe? Lionel Barrymore had a career that lasted over six decades! He passed away of heart failure in 1954. You can find his full NY Times obituary here. For more on his life, hope over to here. As Mr. Potter, through Lionel's portray we might not know where Henry F Potter is or lives during the movie but we always know and feel that he is there somewhere close. When George is feeling most down and frustrated after the visit and bragging of Sam Wainwright ... who gives him a call? When the bank run occurs and the Building and Loan almost sinks ... who gives George a call? When George comes to him desperate and afraid ... who gives the police a call? He and his 'fingers on' are indeed all over the town. Part of that must be due to his hired minions. As a rich man, and due him be confined to a wheelchair we do see various henchmen and minion women that 'scurry' around and carry out his chores. Not named, but seen many times is the man behind Potter pushing him around and likely taking a verbal abuse no one in town gets is the actor Frank Hagney. 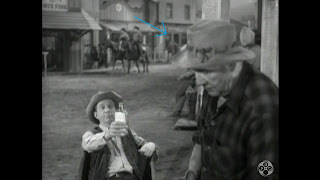 Hagney played bit parts in various films and then was seen on quite a few westerns in the 50's and 60's before his death in 1973. During the film it should be added that Potter's wheelchair henchman ages quite well from the early scenes in 1918 to the ending scenes in 1946. George shouts and relates Potter to his wheelchair pusher in the 'spider' scene, and walking out the door he makes the same insult to another unnamed female Potter bank minion walking in the door. This actress is Almira Sessions, who had a very long career regally acting in dozens of television shows right up to the 70's just before her death. She did everything from the 'Munsters' to 'Carolle Burnette'. 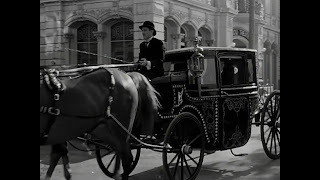 Briefest of all is the driver of Potter's carriage who we presume was canned without much sympathy whenever Potter made the change to automobiles. We can only hope he found some way into Bailey Park rather than Potter's fields. 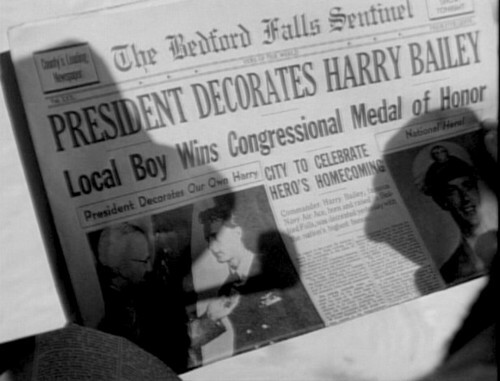 Speaking of the two competing residential areas in Bedford Falls, that brings us to the most vocal of Potter's employees. His rent collector. But we'll cover him when we visit the bank at a later time. Anyone know who he is? As a tip, he was the longest living adult member of the cast. But back onto the home of Mr. Potter. Perhaps some of these employee's lived there, perhaps not. 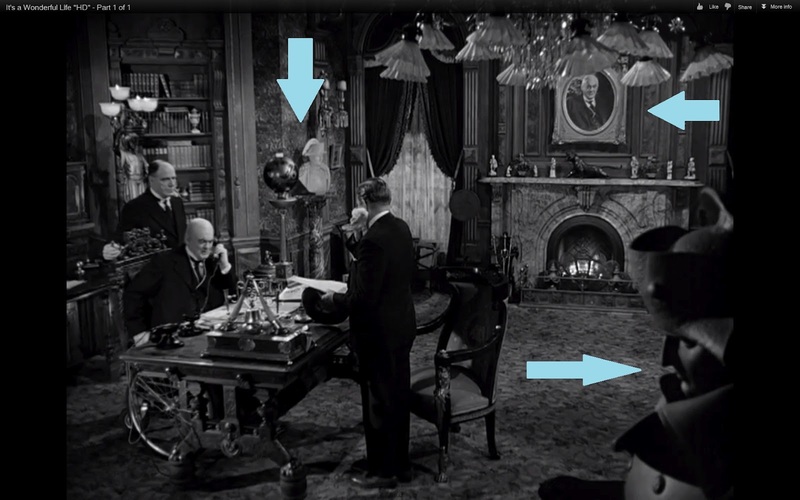 It's not by accident that my imagination can't help but draw comparisons to Ebeneezer Scrooge's flat. In the various incarnations of his place in each 'A CHRISTmas Carol' film, the living arrangements and setting seem to come the closets to what I think Potter's mansion must have looked like. Drafty, wooden, open, dark, and empty. But that's as much as we can do is use our imagination. Enesco did just that when they created their version of the Potter mansion as a web exclusive piece. Not part of a series it was a special unique piece. As I have said and probably will say, some buildings Enesco got just right, others dead wrong. Luckily this one I believe they did a great job on. Keep looking below for my gallery for the Enesco Henry F. Potter Mansion. I think the colors are great, the height and size make for an impressive building when put beside any others of the village. The windows trim is fitting, the small tower does indeed give off a slight castle feel, and the large window also distinguish it. One of the finest Enesco put out. Here are some shots of the building in day light. As the norm, starting with the unboxing. Enesco Henry F Potter Mansion: Box Front. To view the rest of the gallery pics just click the 'Read More' to see them. Enesco Henry F Potter Mansion: Tower centre with circle decor over door and chimney. Enesco Henry F Potter Mansion: Back face. Large two story wall. Windows closed off on this side only. Enesco Henry F Potter Mansion: Angle view. Nice nice view. Notice the good color mix of tan and green. Enesco Henry F Potter Mansion: Other angle view. Notice large window in bottom front. Enesco Henry F Potter Mansion: And another angle view. Steps leading up to door. Enesco Henry F Potter Mansion: Roof front view. Enesco Henry F Potter Mansion: Enesco series stamp. Now some shots with the lights off. Enesco Henry F Potter Mansion: Back vaiew with the closed windows but showing just how many this piece has. Enesco Henry F Potter Mansion: The mega side. This is the one you want facing out to show just how big this building is. Enesco Henry F Potter Mansion: Angle view. No problem, still have a lot to get up but I enjoy it so glad to help.